Lots of different things can make you happy. But which ones should you focus on and why? Learn how to start your happiness journey with this ultimate guide to what makes you happy in life. Which skills should you build first? First, it's helpful to know your strengths and weaknesses so that you can focus on building up your weaknesses. 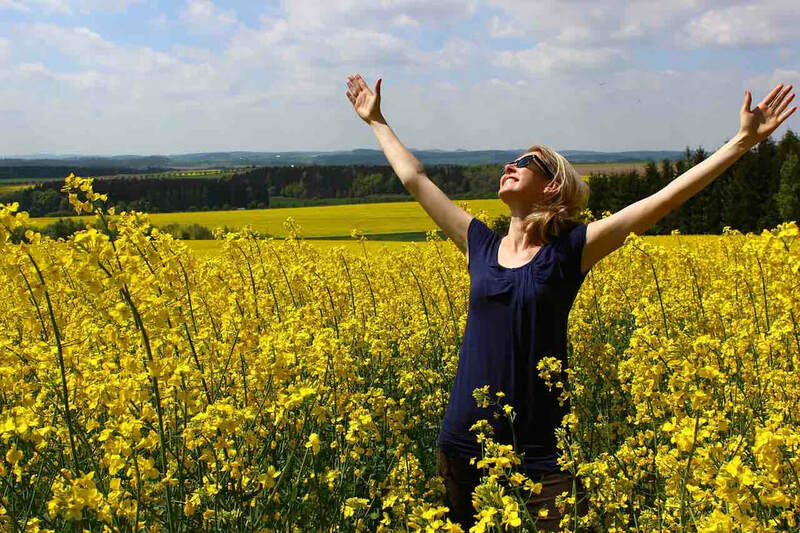 Take our happiness quiz to discover your strengths and weaknesses. You'll get your personalized happiness report. Then you can use the following guide to build the happiness skills that aren't as strong as you'd like them to be. Note: Some of the current skills included in the quiz are not included in this article. 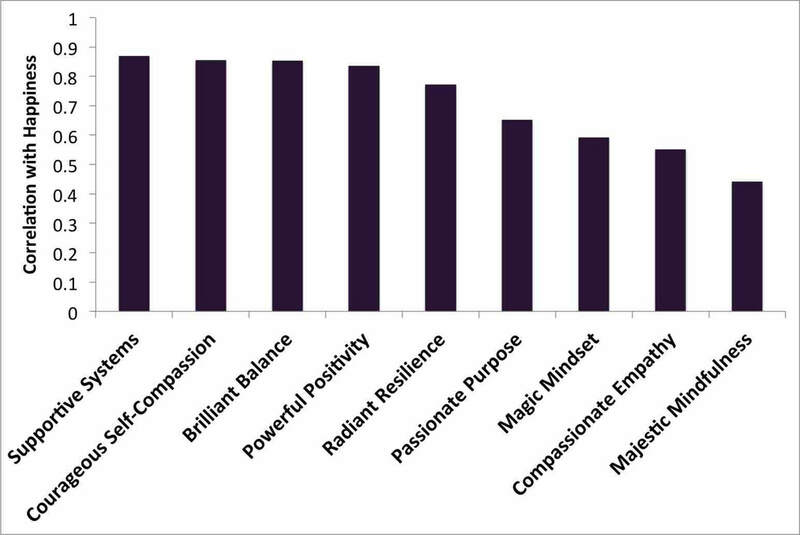 Which skills are most related to happiness? The figure below, you can see that some skills are more important than others when it comes to your happiness. In the figure you can see how strongly each "happiness skill" is related to happiness. ​Supportive Systems is the most closely linked to happiness, while Majestic Mindfulness is the least closely linked to happiness. This suggests that we can benefit more from improving Supportive Systems than we can from improving Majestic Mindfulness. BUT, you also need to keep in mind how strong you are at each skill. For example, if you are already really good at the skills on the left side of the figure, then YOU personally would likely benefit more from building the skills that you personally are weak at. How do you build the happiness skills? Maybe it seems weird that systems can make you happy. But they really can. Because it takes effort to change your life - to create a life that makes you happy. ​You may have noticed that when you start working towards a new goal - like happiness or fitness - you’ll get a burst of motivation. Suddenly, you have the drive to run on the treadmill 4 hours per day, eat only health food, or read 10 books on what makes you happy. But this motivation will run out eventually. Because the more effort we exert, the less motivation we have left. When you develop supportive systems, you strategize, plan, and develop a schedule that maintains your happiness over the long-term, even during times when your motivation is low. ​For example, you can use research proven techniques like making implementation intentions and increasing accountability. This way, systems keep you progressing towards your happiness goals. This helps you keep doing what makes you happy, not just today, but also in a month, in a year, or in 10 years. I have never really believed the word “can’t”. Sure, whatever I want to achieve might be hard, it might take years, I might end up changing my mind along the way, but when someone tells me I “can’t”, that just motivates me to work harder. This belief in ourselves and our ability to succeed in whatever we put our minds to is often referred to as growth mindset. ​Plenty of research has shown that believing in your ability to grow and improve really does make it more likely that you will. Want to be more successful? Want to find love? Want to get better at math? Then change your mindset to one of growth. Research has also found that growth mindset applies to different parts of your life. For example, maybe you believe that you can improve your skills at work but you can't really make yourself happy. When it comes to what makes you happy, your belief that you can’t change your happiness turns out to be a self-fulfilling prophecy. It actually prevents you from being able to make yourself happy. ​But, when you have a magic mindset, you believe that you really can have that amazing, inspiring, fulfilling life that really makes you happy. And when you have a growth mindset, you are one step closer to actually having that life. I have a hard time writing about balance because it is one of the ways that I often make myself unhappy. I really do try to practice what I preach. But balance is something I often work at for short bursts before backsliding into workaholism. When you live a life that is in brilliant balance, you split your time between yourself, your work, and your relationships. You make sure that you have set aside adequate time for rest and recovery as well as fun and excitement. If we don't have balance, it's hard to build any of the other skills. When we don’t feel good about ourselves, it’s easy to think that there’s something fundamentally wrong with us; it feels deeply rooted and unchangeable. In reality, though, we may have failed to clarify (and then pursue) exactly what would make us feel like that person we would love. This is why courageous self-compassion is a key to what makes us happy. Positive thinking is incredibly important for making yourself happy the rest of the time, which is most of the time. When you wire your brain to think positive, every tiny, boring things can make you happy. By harnessing powerful positivity, it makes even the most obnoxious situations more enjoyable. ​Read 16 Simple Ways to Start Thinking Positive. When you are resilient, the crappy things in life don't hit you quite so hard. Your car breaks down. But you see it as an adventure and then move on. Your get laid off at work. But you take this opportunity to figure out what you really love doing. You get in a fight with your romantic partner. But you quickly forgive them and start working toward solutions. You are resilient, in spite of the odds. This is why radiant resilience makes you happy. Because it prevents you from letting the world get you down. Mindfulness is the state of being aware and accepting of your thoughts and emotions. Mindfulness is super impressive. And the impact it can have in your life is huge, if you get it right. When practicing mindfulness, your goal is to be aware and accepting of your thoughts and emotions. Sometimes it is helpful to see your thoughts as leaves, slowly floating down a river or as clouds moving across the sky. You may choose to focus on your breath. Inhale and exhale slowly. When you get stuck thinking about something, just let it go. When you live mindfully, there is something majestic about it. It makes your whole world feel so big, and intense, and real. Because you are present in your life you feel more connected to your self, your life purpose, and that makes you happy. Passionate purpose is that feeling we have that our lives really matter. What gives you passionate purpose could involve working towards a goal, being part of a community, or living in accordance with your values. What is key is that it gives you sense of meaning. ﻿When we have purpose, we feel good about how we are living our lives. It makes us happy because we feel that there is some ultimate reason for our actions and that we are contributing to the world in some important way. This gives us a sense of satisfaction and connectedness. Our strongest relationships are based on more than positive emotions. They require consideration of other people’s negative emotions. This is why compassionate empathy makes us happy. It refers to the ability to put ourselves in someone else's shoes, to see the situation from their point of view, and to feel what they are feeling. When we do this, people feel close to us and we feel close to them. When we put all these things together, happiness just flows, and our lives begin to flow in ways we never imagined possible.